Saturday 17th October was my Sister's wedding. And let me just say, the New Mrs. H looked amazing!!! So gorgeous and beautiful! It was the best day, so much fun and so much love! The ceremony was held at the Rhodedendren Gardens on the way down to Wollongong and the reception was held at the Novotel North Beach in Wollongong. Both venues were absolutley gorgeous! Can't wait to see their pro pics from the beach as well. We were up very early, had to be at the hairdressers at 8:30am. The ceremony was at 3pm with the reception starting at 6:30pm. Finished up around midnight and Mr. P and I finally made it back to our room and bed around 2am! So it was a long day but so worth it! Here's a few pics from the big day. They are mainly people shots so I'll post a couple of pro pics of I'm allowed when they get them. I'll post some pics tomorrow of the decorations and details...my Mum and sister did a great job! 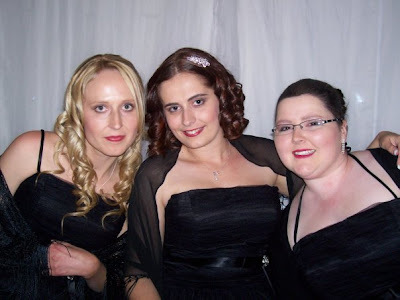 Three very tired bridesmaids at the end of the day, but what a day it was! Brides and babies never look bad. Such a fun day!! Absolutely perfect, the whole thing. I literally LOL'd today when I remembered you literally squealing with excitement in the car on the way down! !